It is officially Summa Time, Summa Time, Sum Sum Summa Time! We want you out there making memories this summer and thought the most fun way to support you would be with a summer of giveaway fun that encourages making memories. 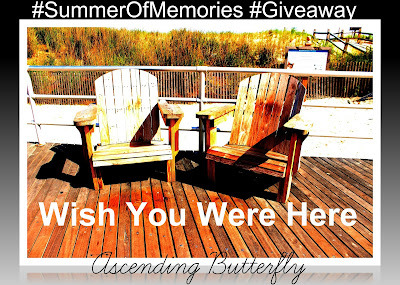 Today we are launching our Summer of Memories Giveaway Campaign - it's a giveaway promotion that will grow all summer! Our first brand up is Tiny Prints and Shutterfly. Read more about my love for them HERE. They are offering YOUR choice of a $100 Gift Card to Tiny Prints or Shutterfly! FTC Disclosure: The Summer of Memories Giveaway Promotion is a Sponsored Promotion - products and compensation have been provided. Sponsors are responsible for prize fulfillment. Neither Ascending Butterfly nor contest sponsor(s) will be held responsible for lost or mis-directed mail. I am disclosing this in accordance with the Federal Trade Commission 16 CFR, Part 255 - Guides Concerning the use of endorsements and testimonials in advertising, you may check our Giveaway and Disclosure Page for additional information regarding Ascending Butterfly Disclosure. All opinions are 100% my own! My favorite summer memory thus far has to be the ginormous bonfire we had a few days ago. We had so much brush piled up from landscaping over the years that we burned it all. It was awesome. So far my favorite summer memory has been spending time with my new granddaughter. In the past, though, it's totally my vacations to Mexico. I have got to say my favorite summer memory so far is watching the fireworks on the pier with my sister last night. It was just so great! So far my favorite summer memory this year has been our trip to the beach!! And then of course the 4th fireworks last night, what a great giveaway! What a great giveaway to have! Thanks for sharing it! I look forward to the Summer of Memories Giveaway Campaign. I will have to share this with my friends so they can do it to. Well this is a fun post! What a great idea to make memories and document them too. This will make summer more fun! I love giveaways. I always make sure that we make a lot of memories during the summer, especially now that my eldest is going away for college! Playing outdoors and exploring with the kids was always so much fun. I loved watching their imaginations at work. I have so many favorite summer memories. I don't know if I could choose just one. Most of them are with my girls when we do many things in the summer like swimming and attending fairs. I love spending extra time with my children and making memories. My favorite summer memory is going camping as a child in Colorado. I hope to be able to take my boys one day. My favorite Summer memory has been watching my kids enjoy Summer camp! What a great giveaway! Best of luck to those participants! One of my favorite summer memories was visiting New Orleans! My favorite part was going to one of my all-time favorite vintage clothing boutiques (Trashy Diva). My favorite summer memories go way back to my pre-teen years when I went to camp. I miss those days and this giveaway is great. Such a fun giveaway idea! The summer is the best time for fun things like this! I have so many great summer memories. My favorite though would have to be from last year. Moving into our first home. We go to spend so many great days in the pool! My favorite summer memory so far is spending time with my family at our family picnic 4th of July weekend. I enjoyed going to the beach with my family!